Two years of service as President of ASP National is a testimony to all that bringing up a special child is not merely about caring for and promoting the life of the child whom God has assigned to me. Beyond that, a parent of a special child is called to be a mother to other kids with special needs, a minister unto fellow parents, a mentor to fellow advocates. As such I felt both the joys and the pains that came with the journeys of thousands of families with CWA’s. I also shared in the victories as well as in the challenges that faced the PWD sector. I had strived to be my natural self in all my undertakings while seeking endlessly to please the Lord in every step that I took. As I step down from this post, I feel a deep sense of joy and honor for having said ‘Yes’ to this calling two years ago. I thank God mightily for this unique opportunity to be a servant in this ministry that is so close to His heart. As a leader I saw many different scenarios of never ending aspirations, needs, wants, qualms, and grievances within the big autism community and the sector. I saw only two solutions to “all the problems” that beset us: One is that which we can execute promptly, confidently and gracefully; the other is that which only God can resolve through time, through our continued hard labor, and faith. Thus, I end my term worry-free, because having worked with people within and outside ASP who steam with heartfelt advocacy, I can see clearly that God is at work to make all our dreams come true in His own good time. We must, therefore, never tire in doing good works for persons with disabilities. I wish ASP all the best in the years more to come. ASP is truly blessed; victory after victory is a stamp of God’s favor. May we continue to be worthy and to be deserving of the crown of life that is God’s promise to all those who labor hard for His cause. Mary Janette I. Peña is the current President of ASP National. She was the former President of ASP Bacoor, Cavite chapter and is fondly called the “Gobernadora of ASP Cavite Chapter”. 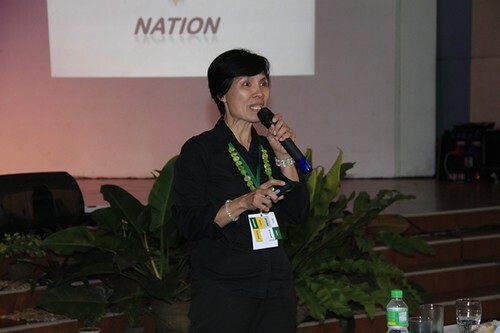 Jan is one of the movers behind the meteoric rise in the numbers of ASP chapters nationwide. Her exemplary efforts have gathered hundreds of members from Cavite alone. Tita Jan and Al, her supportive husband and overseas Filipino worker in the Middle East, are doting parents to her three children, Thea, Muneer (an adolescent with autism) and Milli.